This recipe is embarrassingly easy, but nobody needs to know that. 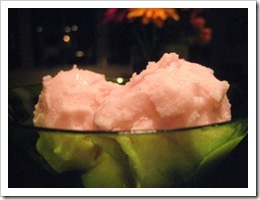 This sorbet makes an excellent summer dessert and can be served with fresh tropical fruit. I like to serve sorbets in martini glasses with a small, colorful garnish. If you want to be less subtle, a coconut shell works, too. Combine all ingredients (yes, all 2) in a blender or food processor until smooth and airy. Freeze. If you’re using an ice cream maker, ensure that the mixture is cold beforehand. If you don’t have an ice cream maker, pour the mixture in a wide, shallow baking dish and still-freeze. After 4 hours (or when ice crystals start to form throughout) scrape with a fork to break them up. 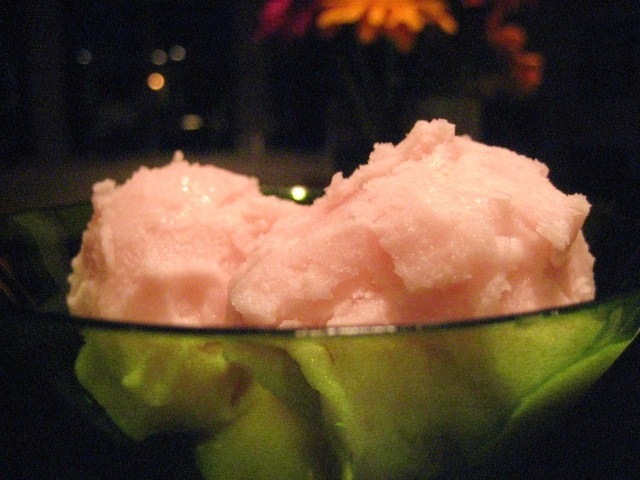 You’ll end up with more of a granita than a sorbet, but it will still be delicious. Preheat your oven to 425F and set your top rack about 6 inches from the broiler. Clean the brussels sprouts under cold water to remove any dirt. Cut the brussels sprouts in half. 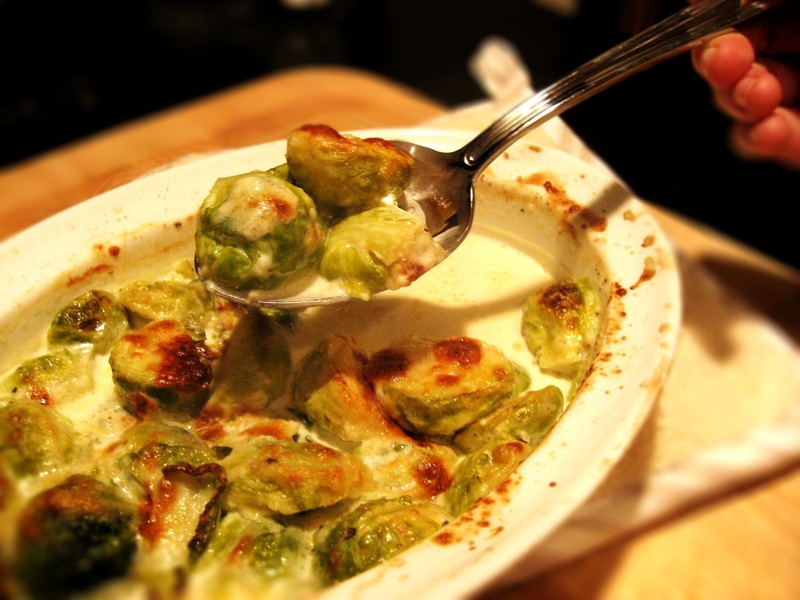 Next, we want to par-steam the brussels sprouts to get them soft, but not cooked all the way through. You can steam them in a vegetable steamer if you like. I’ve found that microwaving them in a baking dish with 1/2 inch of water for 7 or 8 minutes works just as well. 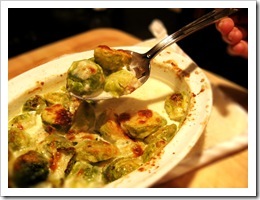 Place the brussels sprouts cut-side-up in an oven-proof baking dish, just large enough so they stack 1-2 sprouts high. Add salt and pepper. Heat the half and half and cream until it just barely starts to boil. Pour over the brussels sprouts. Top with the shredded and grated parmesan. Bake for about 15 minutes, or until the cheese is golden brown and bubbly. Serve to a cautiously optimistic audience, who will soon have a whole new appreciation for this wonderful vegetable. This is my favorite sandwich. It is a perfectly balanced mix of salty, sweet, crunchy and soft. The use of prosciutto and goat brie make it sophisticated enough to serve to guests. Accompany the sandwich with some fresh melon and an Orangina for a great summer lunch. Thanks to Rachel for developing this recipe with me. Heat the olive oil in a large skillet or griddle over medium heat. Add the prosciutto, a few slices at a time. Keep the prosciutto as flat as possible and make sure the slices don’t overlap. Cook until crispy, about 3 minutes per side. Place on a paper towel to cool. Don’t clean the pan just yet. 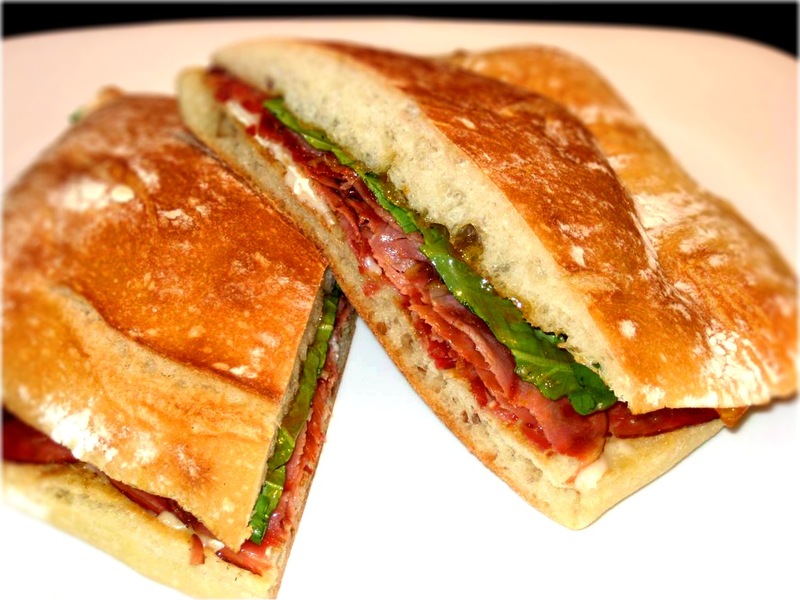 Cut the ciabatta loaf in half (longways like a hamburger bun) and toast the cut sides in the fat left behind from the prosciutto, about 4 minutes. 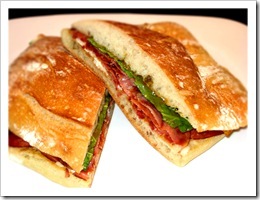 Assemble the sandwich in the following order (it makes a difference :-)) apricot spread, basil leaves, prosciutto, brie. Once you have your sandwich assembled, squash it down with both hands.